A week ago, the team behind Ark: Survival Evolved said that updates to the game would slow as it neared release, but the pace doesn't seem to have changed much since then. Since I brought you news of poop-throwing monkeys less than a fortnight ago, six new creatures have been announced. First up is the Megaloceros, a name I only recognised because it got an episode all to itself in a 2001 Channel 4 TV show called Extinct. Megaloceros is also known as the Irish Elk or Giant Elk. It's basically a really, really big deer that went extinct because of a combination of climate change and overhunting by early man. Next is the Therizinosaur, a dinosaur whose name means "scythe lizard". Only incomplete fossils have ever been found, so the developers have had to apply some creative license, but we know it had these huge claws. The team's description labels the dinosaur a "versatile harvester". Eurypterids are described as "poisonous aquatic adaptable arthropods". People call them sea scorpions but only some of them lived in the sea and they weren't technically scorpions. These things ruled the ocean back in their day, which fortunately was hundreds of millions of years ago. The Arthropluera is a terrifying prospect: a millipede that could have been more than 2 metres long. In popular entertainment the Arthropleura's starring moment arrived in an episode of Walking with Monsters, in which it chases a spider but later dies. 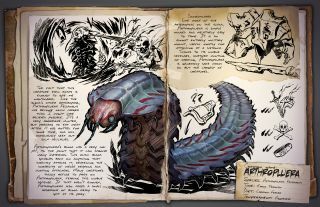 Will a similar fate await the noble mega-millipede in Ark? Apparently the Arthropleura was a herbivore, though in Ark it's an "aggressive acidic blood-spitting arthropod". Then there's Kairuku, which is apparently a "cute and friendly penguin", so pretty different from the rest of the creatures described above. According to the text on the image, they might not be any good in a fight but they can keep you warm. Ark lets you tame and train your own dinosaurs. You can read about Chris L's adventures trying to do just that in our Ark: Survival Evolved diary.